It’s time to say goodbye to year 2016 and welcome a brand new year 2017. 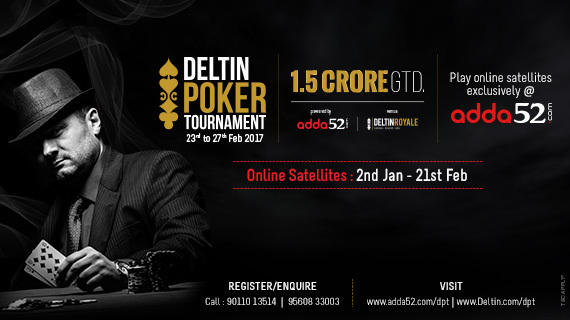 As every New Year gives a chance to start something new and fresh, so Adda52.com and Deltin Royale are all set to organize the first edition of “Deltin Poker Tournament Presented by Adda52.com” for the year 2017. This 6-day poker extravaganza will run from from February 22 -27, 2017, and is set to offer INR 1.5 Crore in guaranteed prize pool. This outlandish tournament will take place at Deltin Royale Casino Goa, and will feature No Limit Texas Hold’em and Pot Limit Omaha Events in various formats like DeepStack and Bounty providing Indian players an ideal poker experience. The tournament series will kick off on February 22 with an online “5K Warm Up” Event which will be followed by live action aboard Deltin Royale Casino in Goa with 10K Kickoff event on February 23. The next in line are two bigger guarantee events – DPT 60K High Roller and Adda52 35K Main Event offering INR 50,00,000 and INR 55,00,000 in prize pool respectively. February 26 is reserved for 10K + 5K Adda52 Bounty with INR 10,00,000 in prize pool and the series will culminate on February 27 with ‘15K 6-Max PLO Event’. Many online satellites have been planned around this exclusive poker carnival starting Jan 2. Indian poker players can play DPT 30K ME Satellite (Buy-in: Rs. 1,500) and DPT 60K High Roller (Buy-in: Rs. 3,750) to win an entry ticket to these events. The players who win of DPT 60K High Roller satellite will also get an accommodation for 5 days / 4 nights (worth INR 10,000 on twin sharing). Players can also play DPT Mega Satellite every Saturday and Sunday (Buy-in: Rs. 5,000) to win entry tickets to both- DPT Adda52 35K ME and DPT 60K High Roller, and 5 days/4 nights hotel accommodation in Goa. Furthermore, there will be a Super Satellite (Buy-in: Rs. 7,000) wherein players will get an opportunity to qualify for all the 5 events along with accommodation for 6 days / 5 nights and flight tickets (economy class worth INR 10,000).